The Royal Ballet’s brand new production of Alice in Wonderland was an enormous hit with the audience at its gala premiere in London last night. It’s the Royal’s first new full-length ballet to a commissioned score for over twenty years and Christopher Wheeldon was entrusted with making it a success. With a team featuring Bob Crowley on Designs and Nicholas Wright on the Scenario, there was a host of top West End and Broadway talent at his disposal. The result is a cornucopia of special effects, film projections, magic, scene changes and dazzling costumes that capture the comic nightmare-ish mayhem of Lewis Carroll’s tale but often at the expense of the dancing – it’s more a great show than a great ballet. Carroll’s much-loved story has been updated so that Alice, played here by a fabulously convincing Lauren Cuthbertson, has reached the grand old age of 15 and been given a love interest in the Knave of Hearts, danced with great aplomb by Sergei Polunin. Unfortunately Wheeldon’s not given them a great deal to do together which is a shame as when they perform their extended love duet in the courtroom they manage to overcome the preceding chaos to create something rather affecting. Unlike John Tenniel’s original illustrations, most of Carroll’s original characters have been spared the chop and thus we encounter an unforgettably dismembering Cheshire Cat, an enormous Caterpillar on pointe and a scene-stealing Mad Hatter played by Steven McRae showing off some formidable tap-dancing skills. Highlight of the ‘supporting’ cast, however, is Zenaida Yanowsky’s outstanding Queen of Hearts. She is simply hilarious and every inch the highly-strung hostess; her ‘Sleeping Beauty’ Jam Tart Adage with four terrified knights had the audience laughing their heads off. Joby Talbot’s score is crucial to the work. Veering wildly from crazy tangos to the sweeping romanticism of the love duets, it too brings out the manic nature of Carroll’s vision. With a huge orchestra and the volume turned up to 11 it occasionally overwhelmed the action on the stage but it’s basically great fun and highly energetic. 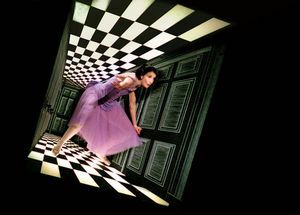 The staging went through an equally bewildering array of changes in the first act, with Jon Driscoll and Gemma Carrington’s film projections a major feature; Alice’s hypnotic descent into Wonderland was truly memorable and the Pythonesque axe announcing the interval was a nice touch. Costumes are always one of Covent Garden’s strengths and there was an astonishing variety on display here; flamingos, adorable little hedgehogs and the fifties glamour of the ballroom scene, to point out just a few, were all ablaze with colour and creativity. Finally, Natasha Katz’s lighting was particularly effective when evoking the more surreal aspects of the production. There were a few blips; the Pig and Pepper scene was a little too grotesque, both acts got temporarily bogged down in the middle with a lack of purpose and sometimes the technology got in the way (why did the Caterpillar’s mushroom start roaming around the stage, for instance?). Ironically, what the show could do with more of is choreography; the ‘Sleeping Beauty’ pastiche and the love duets aside there isn’t much to recall. However, on a night when even the trees took a bow to a rousing ovation, you know you’re on to a winner. As I said before, a great show. This entry was posted in Alice in Wonderland, Christopher Wheeldon, Royal Ballet and tagged Alice in Wonderland, Christopher Wheeldon, review, Royal Ballet. Bookmark the permalink.